We were supposed to be at the school at 6 in the morning in order to head out of town and be on time for everything that was planned, but we ended up taking a little bit longer as some people were running late. We eventually headed out at around 6:40 and made it to San Diego at 10. We stopped at IHOP for breakfast (this was the beginning of the non-stop eating, believe me it sounds good but no - no it wasn't haha). Breakfast was a lot of fun :D we got to chit chat with one another, but unfortunately they seated all of us in a really long table that meant we were all pretty squished in order to fit everyone in since there were about 39 of us. I ordered the split decision french toast breakfast (i think it was called) but I had some adjustments. Instead of sausages (since I'm not a fan) I asked for hash browns (which I shouldn't have ordered at all), scrambled eggs, and instead of extra pan cakes (also not a fan of) I got a fruit bowl. After the french toast, eggs, and bacon I was about ready to explode!! IHOP gives you your money's worth but I just couldn't fit more inside my stomach. When we arrived we got to go on a bus tour around the park. Yes!! I got to ride a double decker bus :D I know it was not in London, but hey it still felt pretty great riding one! The first animal that caught my attention was the bear that was taking a swim. He looked so cute!! I know you can't really hug a bear because they say "it's not safe" but I so wanted to hug that bear!! One of the exhibits that I was most excited about was the Polar Bear. The guy that was giving us the tour told us that these fellas became used to the nice cooling California weather that if the water temperature falls below what they are used to, they won't get in haha. This is a little Timon :D, She's so tiny!! This is a little sea otter (if you couldn't tell) and picture of it's home. I was most excited to see the Gorilla's but I didn't get to see them since they were on the other side of the park! I suggest that if you go to a zoo, it's best to go when you have a lot of time so you can really enjoy every exhibit. My friend and I took the Sky Line to the top of the park. Sadly, we didn't realize it was literally a one way trip. It ended up leaving us at the very top of the zoo! Meaning we had to walk our way back down, unless we wanted to pay another $4 each to ride the skyline back. We decided to just torture ourselves and walk back down, but on the bright side we were going to detour and look at some of the other animals. I didn't get to see the Polar Bear though as it was either eating or taking a nap. We also ended up getting lost on our way back down, which took us even longer and we had 20 minutes to get back down to the entrance for lunch. Luckily, they ended up moving lunch to when we left the park. Then we headed out to Buena Park where we would be staying at the Knott's hotel. By this time everyone was already tired and just ready to fall asleep. The hotel was a 5 minute walk from the amusement park, which was great! Especially since we would be exhausted by the end of the day. Yes, I know your thinking it. I did in fact put too much powdered sugar on my french toast. I deeply regretted it as I started inhaling that thing every time I went to take a bite. I conquered two of my fear that day!! 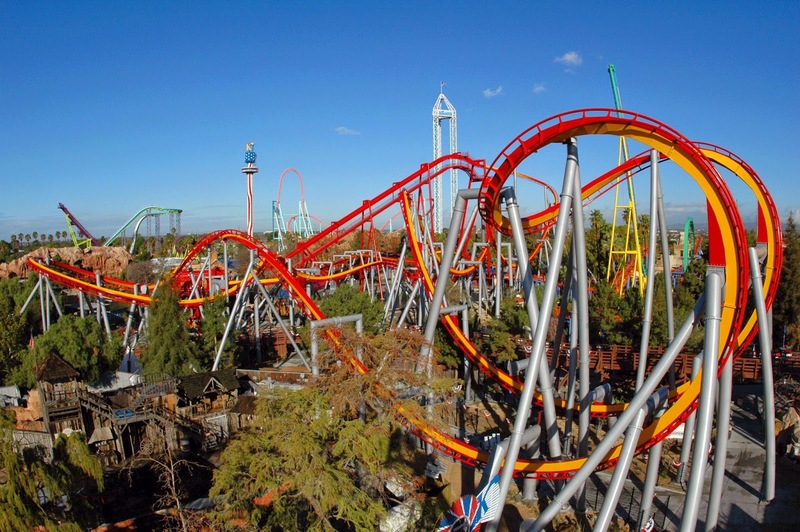 I went on the Silver bullet and the Xcelerator. The Silver Bullet (above) consists of your sitting in a chair like seat with your feet dangling. I wasn't really nervous to go on it this time around, but I feel like I was nervous on the inside. Let me tell you though! Best Ride Ever!! We almost didn't get to ride it because the seats weren't working and they ended up delaying it.The Xcelerator (pink on below) has no chill. Unlike other rides that kind of ease you into it, this one takes off at about a million miles per hour. Once you get past the giant drop the rest of the ride isn't that bad. We ate lunch inside the park. Let me tell you, it was absolultey delicious but expensive. It was about $15 a plate now times that by 39 :O They do give you a lot of food though, I had trouble finishing mine. I would like someone to tell me that these aren't the coolest chairs you have ever seen!! They also had a Lego store! How are these even possible!? How? A very crappy picture of the House of Blues. On our way to the restaurant, our bus kind of turned into a party bus as Mexican music started playing and every got all rattled up and started chanting each others name (to get them to dance). Everyone was clapping along and dancing! I can't explain it but it was just so much fun! As you can tell, we went to a Mexican restaurant and I ordered Tamales. I'll be 100% honest thought they weren't that good :/ I was also still backed up from the Ihop breakfast we had on Monday! The next day we went to 3 museums. The Colombia Space museum, The Titanic Museum, and The Bodies Exhibition Museum. Then we went right over to the bodies exhibition which is in the same building as the titanic one. They had actual bodies that have been donated to science. It's so crazy to see what we look like! They had organs, bones, veins, nerves, and arteries displayed. There was also a babies section, which was a little upsetting knowing that most of those babies might have either not made it or were given up through adoption. But it was such a good experience getting to see what the babies look like while they are still in the womb. The museum gives you an option to walk in and see this particular exhibit or continue on the the end of the tour. I went in to see it and it's just so mind blowing how that can literally grow inside of a human body!! They had them in these cylinder style type tubes with a liquid which I'm guessing is used to preserve them. It starts off when the baby is still just the sperm and egg , then it moves on to the tiniest little bean sized thing and it goes up to 36 weeks ( I think they had it at every 4 weeks). The babies looked like little gelatins with the tiniest little bones and limbs. We ended up getting home at around 11, which was actually the time they said that we would. I never understand how we are always behind on time but always - always make it back on time or even before. Does that ever happen to you guys? Overall the trip was so much fun :D and I enjoyed every bit of it. What an awesome looking trip!! I have been wanting to go somewhere so badly recently! Thank you! :) I hope you get to :D Did you have any where in particular in mind? very cool post...love all of the photos! Aww these pictures show that you had an amazing time. 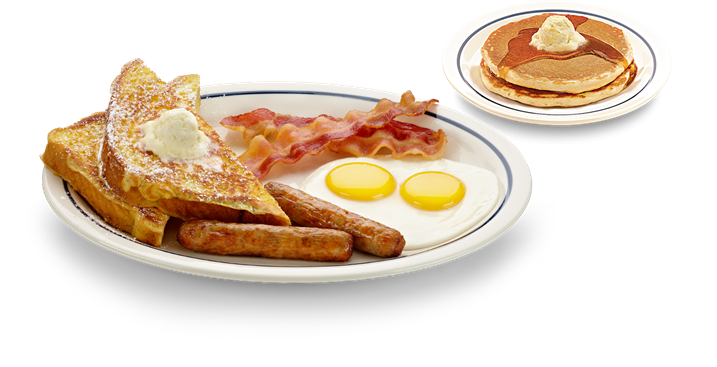 I would love to visit IHOP one day when I'm in USA. I too want to hug that bear it's so cute. Great oost. Right! it just looks so fluffy and cuddly haha. I hope you get to :D Have you ever visited the U.S.? This looked like such a great trip! 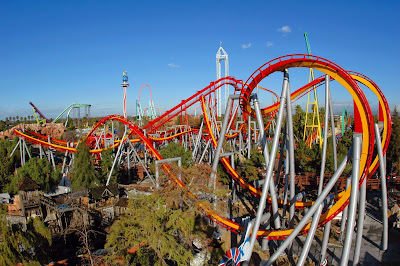 That theme park reminds me of our theme park here, Canada's Wonderland. Thanks for sharing with us! I'm actually not too sure what I'll be up to this summer... I already went to Cuba this past spring so I'm not sure if I'll be taking another big trip anytime soon. Hope you're having a lovely weekend! WOW what a crazy adventure!!! Wooooha the silver bullet looks like so much fun! How did you not spew up on it though? haha. We have this ride at Rainbow's End in New Zealand called Power Surge where it spins around in a circle in the air and then the seats spin all the way around too... I just about cried on it lol!